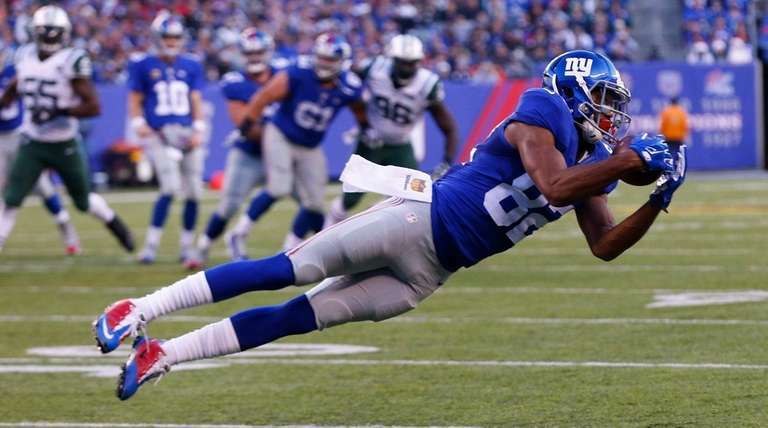 With Odell Beckham Jr. out, who will pick up the slack? The Giants are spending their Christmas figuring out how to win with Odellf on the shelf. The Giants have spent most of this season looking toward Beckham whenever they needed an offensive boost. Now he’ll be serving a one-game suspension and be unavailable to them when they face the Vikings on Sunday night. So who can become the playmaker in his absence? The fact that there is no clear answer may be alarming. If Harris, who was spotted still wearing a sling on his arm to protect his ailing shoulder and was limited in practice on Thursday, can’t play, it could be another blow to the pass-catching group. The Giants will monitor him closely before taking the field in Minnesota. As insurance, they promoted rookie wide receiver Ben Edwards from the practice squad to the active roster to fill the spot left by Beckham’s suspension. Randle is the most likely player to be leaned on. He’s been here the longest and is a second-round pick in his fourth year. He’s never played as a number one receiver, though, and has had an up-and-down season. His production is roughly half what Beckham has given the Giants this season: 51 catches for 638 yards and six touchdowns compared with Beckham’s 91 for 1,396 and 13 TDs. Randle spoke a few weeks ago about his frustration stemming from a lack of opportunities, but it’s unlikely he’ll have the same complaint after this game.